Trax records Trax's glory years were the mid-to-late 1980s. In 1987 they gave the world its second gift when Phuture released 'Acid Trax'. 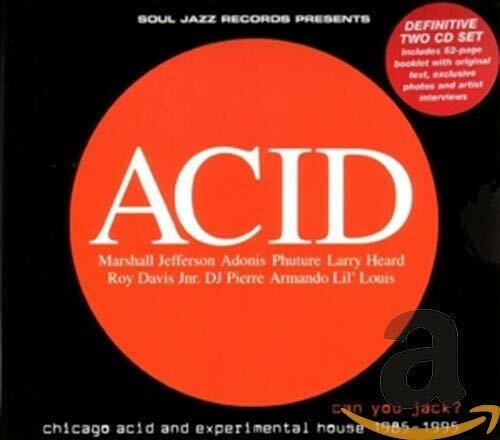 Written by Herbert J, DJ Pierre and Spanky and produced by Marshall Jefferson, it was the first acid record. House music is so impersonal, minimal and repetitive it seems to take effect beneath the level of conscious hearing, sweeping you up by a process of `molecular agitation'. Acid house is the purest, barest distillation of house, the outer limit of its logic of inhuman functionalism. With acid, black music has never been so alien-ated from traditional notions of `blackness' (fluid, grooving, warm), never been so close to to the frigid, mechanical, supremely `white' perversion of funk perpetrated by early eighties pioneers like D.A.F. and Cabaret Voltaire. Acid house is not so much a new thing, as a drastic, terminal culmination of two tendencies in house: the trance-inducing effects of repetion and dub production; a fascination for the pristine hygiene and metronome rhythms of German electronic dance. Pure acid tracks like Tyree's `Acid Over' recall the brute, inelastic minimalism of D.A.F. - it consists of nothing but a bass synth sequencer pulse reiterated with slight warps and eerie inflections. Other tracs parallesl the obscure innovations of bands like Suicide, the Normal (`Warm Leatherette'), Liasons Dangereuses (very big in Chicago), Die Krupps (proto-metalbashers and an early incarnation of Propaganda). Ex-Sample's `And So it Goes' combines cut-ups (`Heroin Kills'), unidentifiable bursts of distorted, sampled sound, and human cries torn from their context (agonies of ecstasy or distress), in a manner not unlike Front 242. Reese's [...]`Just Want Another Chance' sets a guttural, Cabaret Voltaire monologue of desire over the spookiest of Residents synth-drones, an ectoplasmic bassline four times too slow for the drum track. `Strings Of Life' by Rhythim-Is-Rhythim (a.k.a. Derrick May, a prime mover on the acid scene) takes the sultry swing of Latin disco and clips into a spasmodic tic that's deeply unsettling; his `Move It' is a perimeter of trebly rhythm programes that restlessly orbit the black hole where the song should be, and strangely recalls one of those lost, desolate Joy Division B-sides. Weirdest of all is `Acid Trax' by Phuture, the record that started the whole fad off. The `Cocaine Mix' starts with a treated voice midway between a dalek and the Voice of Judgement that announces, `This is Cocaine Speaking'; spectral eddies of a disembodied human wail (reminiscent of nothing so much as PiL's `No Birds Do Sing') simulate the soul languishing in cold turkey; then we're launched on a terror-ride that again reminds me of PIL's `Careering' or `Death Disco'. `I can make you like for me/I can make you die for me/In the end/I'll be your only friend.' If disco was always ment to be about escapism, acid is about no-escapism. In this, acid house takes after the white avant-funk of the late seventies/early eighties, its concept of disco as trance, a form of sinister control or possession. The flash and dazzle of disco classics like Chaka Khan's `I'm Every Woman', Michael Jackson's `Off the Wall' album, or anything by Earth Wind and Fire, is replaced by a clinical, ultra-focused, above all inhibited sound. Expansive and expressive gestures are replaced by a precise and rigorous set of movements, _demands_ on the body; flamboyance and improvisation by a discipline of pleasure. Perhaps there's a kind of `liberation' in submitting to the mechanics of instinct, soldering the circuitry of desire to the circuitry of the sequencer programmes. Import exclusive compilation featuring 36 of the maddest acid tracks ever! Highlights include, D-Mob & Gary Haisman 'We Call It Acid', S'Express 'Superfly Guy', Lil' Louis 'French Kiss', 808 State 'Pacific State', A Guy Called Gerald 'Rockin' Ricki', MARRS 'Pump Up The Volume', Frankie Knuckles & Jamie Principle 'Baby Wants To Ride', Adamski 'NRG', Ten City 'That's The Way Love Is', Inner City 'Good Life' & Josh Wink 'Higher State Of Consciousness'.